International beach vacations were once reserved for that unapologetically wealthy tech scion in your freshman dorm who casually mentioned his “summer on the Côte” while everyone else hoped to scrounge gas money to Panama City. And, true, trips to St.-Tropez aren’t exactly going at a deep discount these days. But that doesn’t mean you can’t take a solid beach trip on a moderate budget -- inside the United States, especially. TravelBird put together what it calls the Beach Price Index, an attempt to compare the cost of a day at the beach in 310 places around the world, accounting for water, food, sunscreen, snacks, and local currency. Some of those spots are in hard-to-reach locales, others offer beaches a bit more on the rugged side than powdery sand and swaying palms. 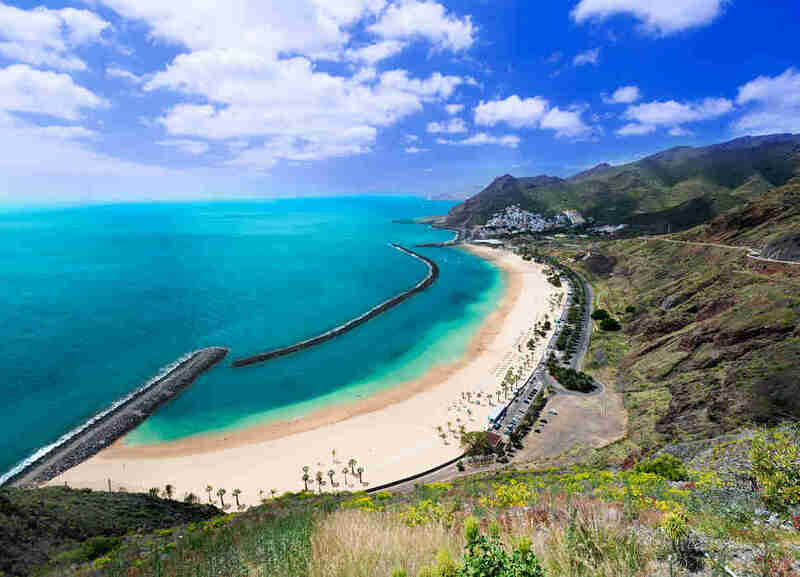 But of the places you can reasonably fly to from the States -- and some even within the USA -- we’ve picked out 15 exceptional yet dirt cheap beach jaunts you can take this year. Uluwatu might be the world’s cheapest hard-core surf destination, home to five world-famous breaks and subject of the 1971 Australian documentary Morning of the Earth. The surfing is high-level stuff, so nobody’s going to blame you for relaxing in a beach shack and enjoying a cheap beer next to the breaks. While you’re here, definitely check out the Pura Luhur Uluwatu temple, an 11th-century Hindu temple atop a hill with the best views of the beaches. Budget for the trip: The flight to Bali is your big expense, at about $900 from LA. But if you happen to be in southeast Asia and can get to Bali cheaply, a taxi from the airport is only about $10. Your daily cost on the beach isn’t much, around $20 a day and meals under $10. A room at a nice resort rarely tops $80 a night. As the last outpost of beaches along the coast of Cancun, Playa Delfines is often the least-crowded, a much chiller experience than you’ll have jostling with tourists further south. It’s also walking distance from Mayan ruins, and it’s not at all uncommon to see dolphins jumping just off the coastline, as the beach’s name might imply. 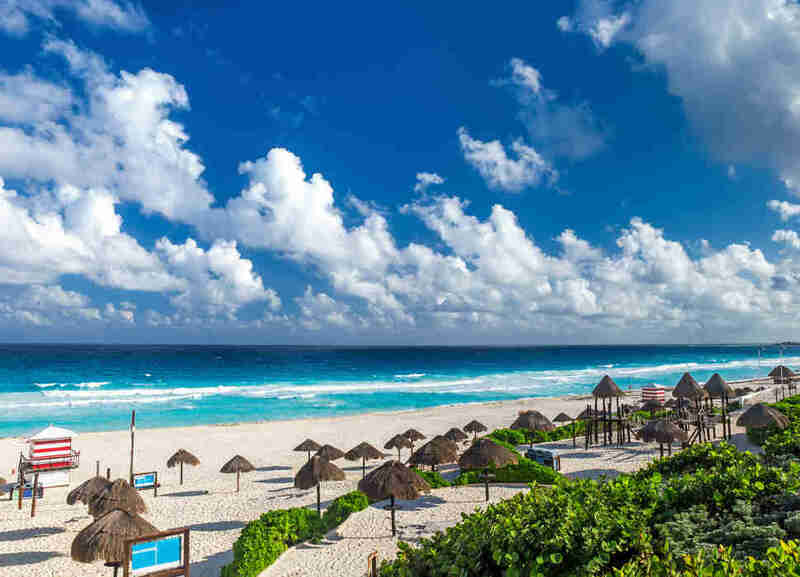 Budget for the trip: Hotels in Cancun, if you stay away from the big resorts, are typically $50 a night or less, and comfier than you might expect. Flights run about $350 to $400 from the States, and once you’re there, you’ll can get by on about $23 a day. The cheapest beach in Europe to spend the day is Queens Beach, the rare uninterrupted 2-mile stretch of sand along Croatia’s coastline. After you’re done gazing out at the azure Adriatic, you’ll find a town quite worthy of your visit, with buildings dating back to the ninth century, cobblestone streets, and Roman ruins dotting the landscape. Budget for the trip: About $860 to get there ($839 flight from the East coast to Zagreb, $21 bus ride to Nin). 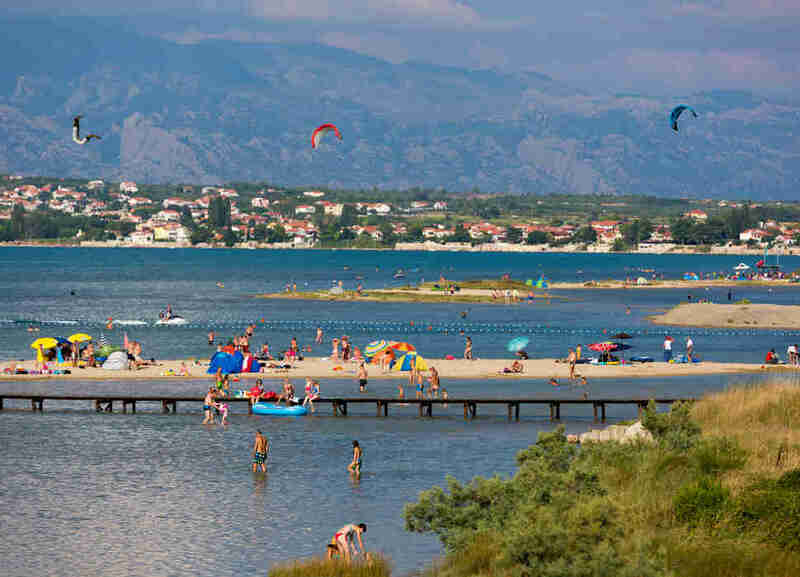 Hotels can be had for about $60 a night in nearby Zadar. Everything else you can cover for about $19 a day. Everyone in central Florida who wants to have an epic beach day makes their way here on the weekend. What results is one of the best beach parties in America, a sand-borne tailgate party where instead of playing football, people play in the ocean. If you find yourself on a landlocked Florida vacation to theme parks or otherwise, spending a day here is affordable and a whole lot of fun. Budget for the trip: Flights to Orlando can be had for $200 or less from most of the country, and hotels there are abundant and cheap, with decent spots in the $50 to $60 range. Rent a car for a day for about $25, drive to the coast, and BYOB to maximize the value. 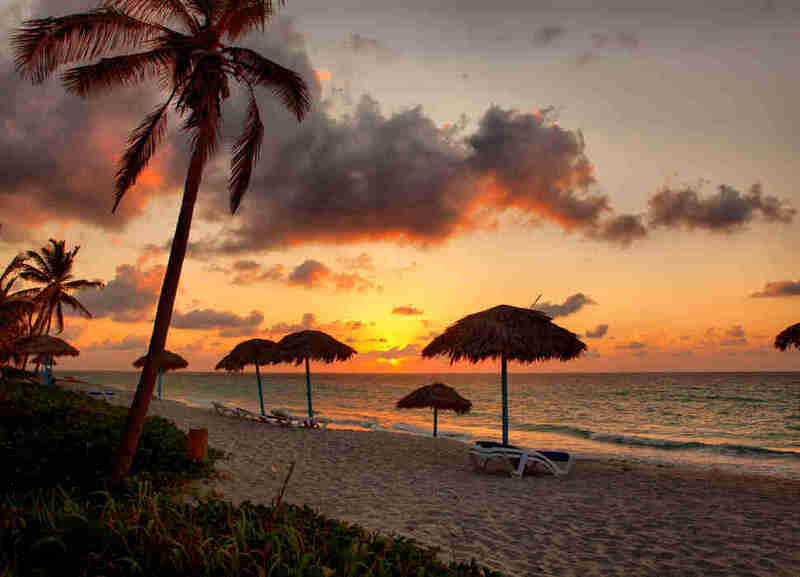 The most famous beach in the DR is also the cheapest in the Caribbean; once you get there, you can coast on $20 a day. 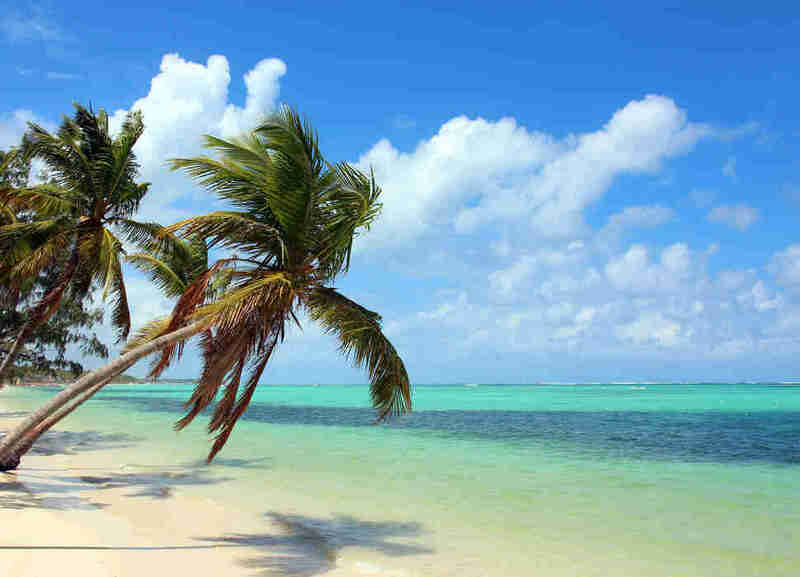 The beaches here are all the bright white sand and turquoise waters of your Caribbean fantasies, and only a few hours flight from most US cities. It’s also home to some of the best golf courses in the islands, and a marine park where you can swim with dolphins or play with manatees. Budget for the trip: Punta Cana has been filled with not-cheap resorts along its famous beaches, and a non-terrifying hotel room here will run you at least $150 a night. But it’s a short, cheap flight, at least. Fares from the East Coast often fall below $300. Though technically this border city sits in France, it’s more accurately described as Basque Country, home to that unique enclave on the Spanish-French border. Hendaye Beach sits wedged between the Pyrenees and the Atlantic, and while an afternoon enjoying the sun is great, the old city at the top of the hill is definitely worth a visit. It’s an old Basque city with fascinating architecture and sweeping views out over the Bay of Chingoudy. A short drive or bus ride gets you to San Sebastian, one of the smallest foodie capitals on the planet. 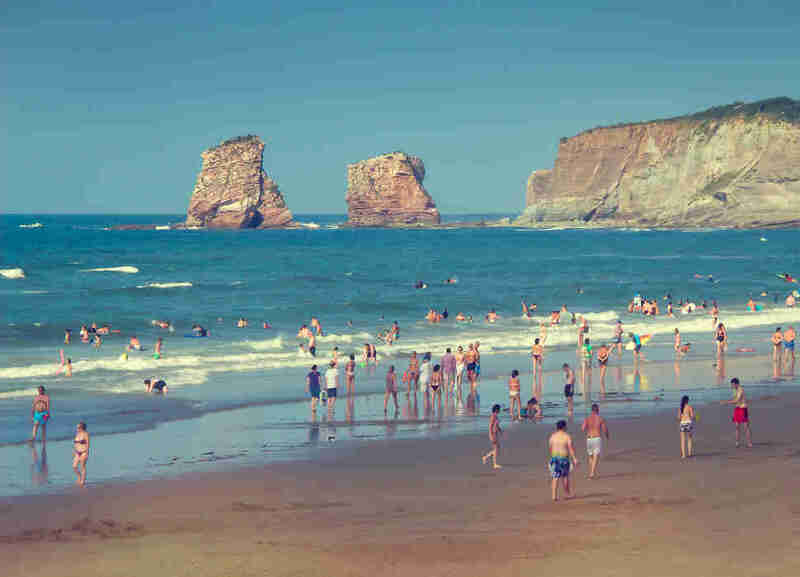 Budget for the trip: Flights to Madrid are stupid cheap right now, and if you can land one of those $400 to $500 specials, it’s worth the five-hour bus ride to Hendaye for about $45. In town, your daily costs are only about $31, and a good hotel is about $75 a night. Budget for the trip: Getting to La Gomera requires a flight from mainland Spain followed by a ferry. Flights from Madrid run around $125, with the ferry about $45. Add in a hotel for about $60 and about $35 a day for everything else, and you get a fantastic, cheap, secluded European beach getaway. 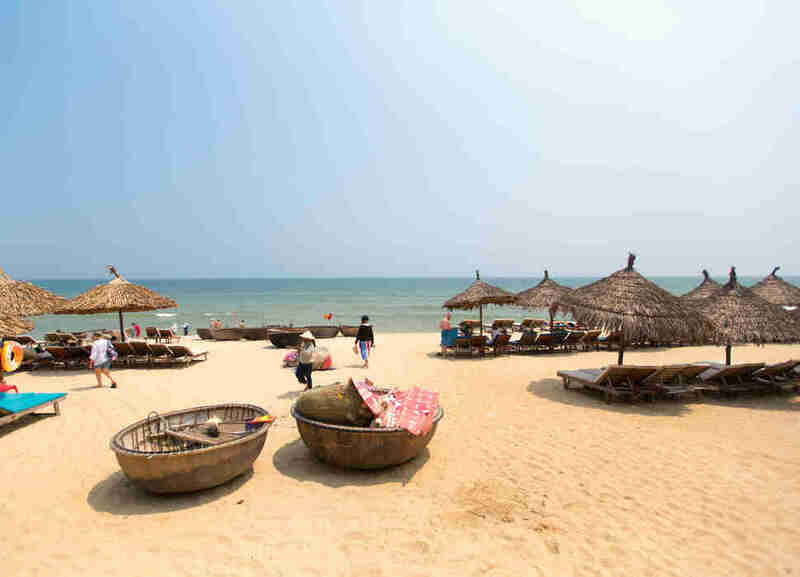 Not only is Hoi An among the cheapest coastal cities in the world to live, this tranquil palm-filled beach near Danang is the cheapest to visit. 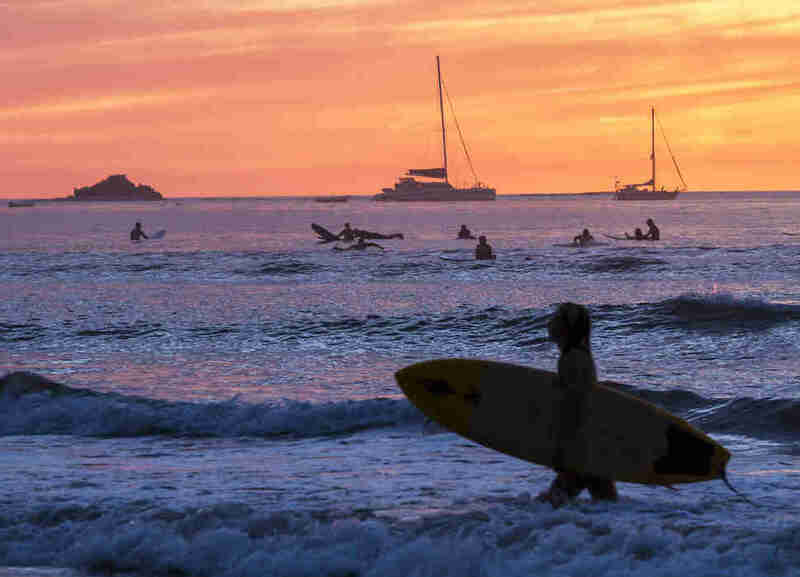 Though the beach has had some erosion issues over the years, it’s not jammed full of hotels, and gives you an opportunity to experience the world-class surfing that had American soldiers falling in love with this area 50 years ago. Budget for the trip: Getting here is really the only expensive part, so if you’re already doing a southeast Asia expedition, this is a prime beach stop. A flight from LAX is about $1,000 to Danang, then a $20 cab ride to Hoi An. Hotels are about $50 a night, and your other daily costs amount to a measly $13. Budget for the trip: Faster but more expensive is probably flying to Liberia, Costa Rica -- about $500 plus a $20 bus to Tamarindo. Slower and cheaper is a San Jose flight ($100 cheaper, give or take) and then a five-hour $25 bus ride. Once you’re to Tamarindo, hotels are regularly under $50, and your daily costs are only about $26. You can sum up this jewel in just five magical words: cheap Greece beach party spot. The town boasts six beaches, each of which boast bars right on the sand (or pebbles) where a beer will run you $1.50 and a full meal costs barely $10. If drinking in the sun gets boring, you can cool off in the inviting blue waters. 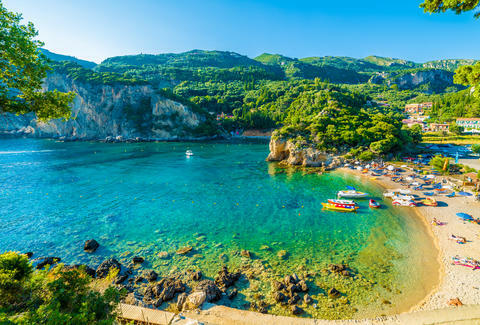 Budget for the trip: Go a little later in the summer, and hotels in Corfu are only about $60 to $80 a night. Getting there can be a little trickier. 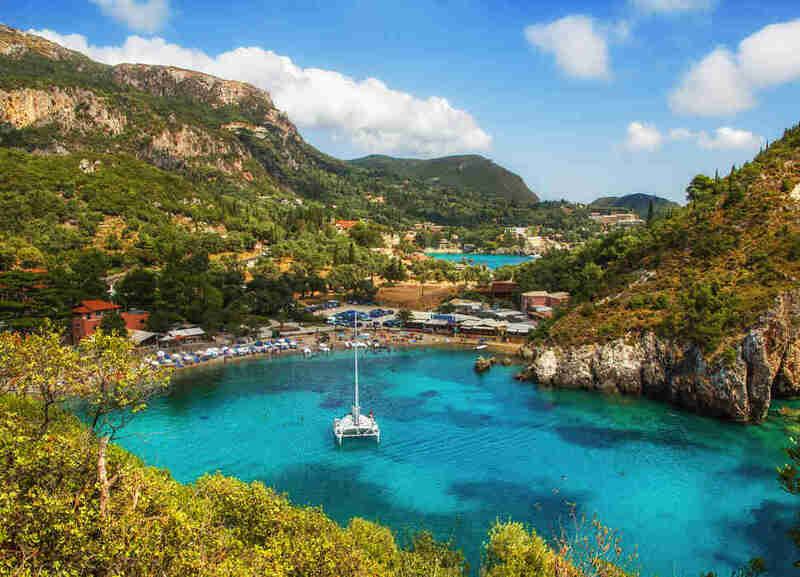 You’ll need to fly to Athens (about $625) then jump a short flight to Corfu ($50) and take a bus for about $4. Once there, your total cost per day for everything else should clock in at about $20. OK, so getting here might be a little trickier than it was a few months ago. But if you can finagle it, a flight to Varadero is about $200 from Miami. Varadero Beach is relatively unspoiled; the diving here makes you feel like you’re the first human who’s ever been underwater. Add in some of the friendliest people in the world working along the sand, and you’ve got the best all-around beach day in the Caribbean. Budget for the trip: After the flights, figure about $100 a night for hotel. You don’t even need to do an all-inclusive when your other costs only run about $26 a day. This small cliff-lined beach near one of the world’s cheapest beach towns is a secluded spot that, if you hit it on the right day, feels like your own private slice of paradise. The massive cliffs and small caves that sit just off the sand give it a deserted-island feel. 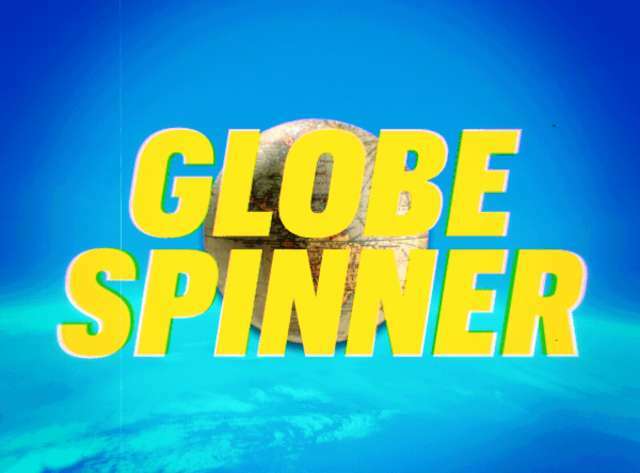 On summer weekends you might find yourself sharing it with a good number of in-the-know locals. Budget for the trip: TAP is doing its part to pump up Portuguese tourism, and round-trip flights to Lisbon are regularly $600 or less from the East Coast. For about $50, two trains take you from Lisbon to Algarve. Once you’re there, the famous cheap food, wine, and beer of Portugal are at your disposal, and your costs will be minimal. Hotels aren’t bad, either -- as little as $40 a night. Lately cruise ship passengers have crowded parts of this outpost of Caribbean scenery. All you have to do, though, is head a little further up from the big resorts to find yourself on one of the most underrated beaches in the region. Thick groves of palm trees lead up to shiny white sand. Venture off the beach and you’ll find funky-cute bars to enjoy a beer for only a couple of dollars. Budget for the trip: Though getting to Roatan generally costs in the $600s from big airports on the coasts and the Midwest, hotels are surprisingly cheap at about $50 to $60 a night, and your daily costs beyond that are about $26. 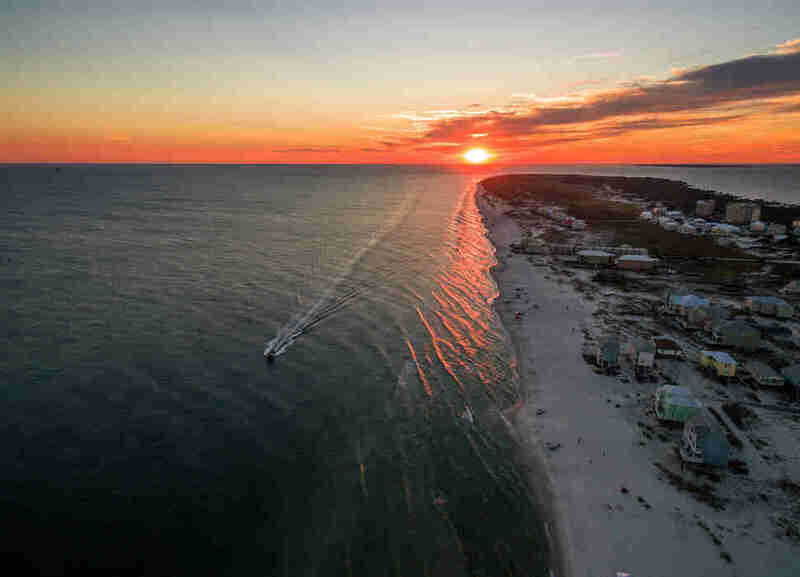 The value along the northern part of America’s Gulf Coast (don’t you dare call it the Redneck Riviera!) is easily the best in the country. 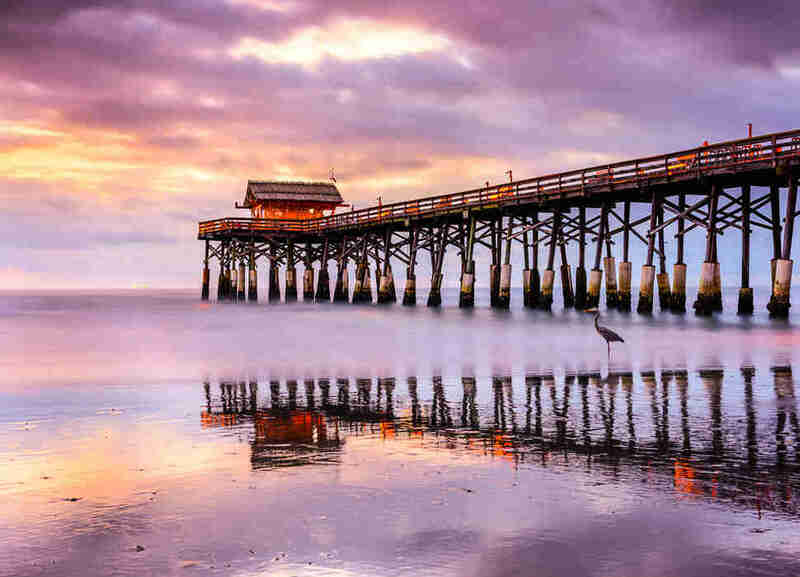 The cheapest beach destination in the US, according to TravelBird, is Gulf Shores, where the beaches rock all the white sand and calm Gulf water of places further south in Florida, for a fraction the price. The quiet, funky beach town filled with pastel houses and legit-good food doesn’t gouge tourists, and is also home to a surprisingly diverse zoo. On Sunday, head a piece down the road to the (in)famous Flora-Bama bar. Budget for the trip: Flights to Pensacola are only a couple hundred dollars from nearby Southern cities, though it’s almost easier to drive. Go during non-summer months and you can rent an entire, three-bedroom condo for $500 for a weekend. Your daily cost shouldn’t exceed about $35 a day. For diversity of nature on a budget, few beaches in the western hemisphere can rival this little island in the Lighthouse Reef atoll on the Belize barrier reef. 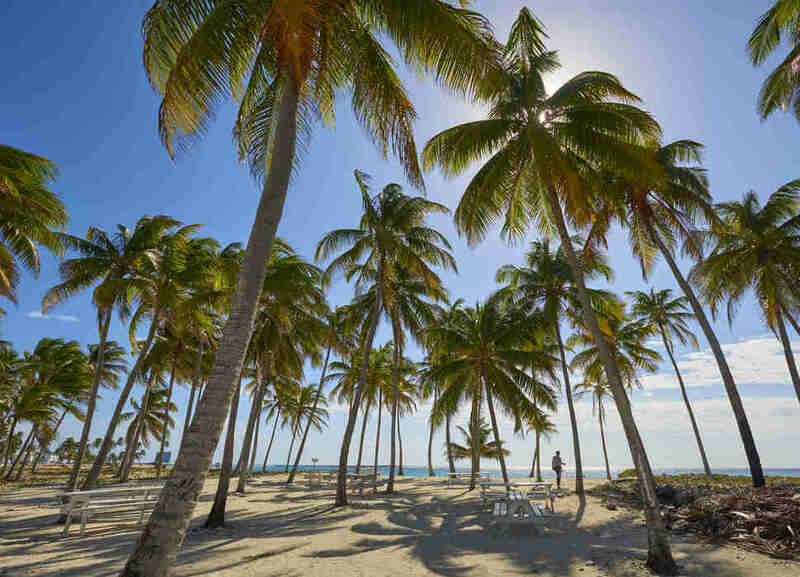 Half Moon Caye is a national park, with crystal clear waters and world-class wall diving. Because the area is completely undeveloped, it’s absolutely teeming with marine creatures and birds. It happens to be the breeding ground for the hemisphere’s only red-footed booby colony. Budget for the trip: If you’re a diver, trips are a pretty good value with a full day of three dives and a long boat ride for about $250. 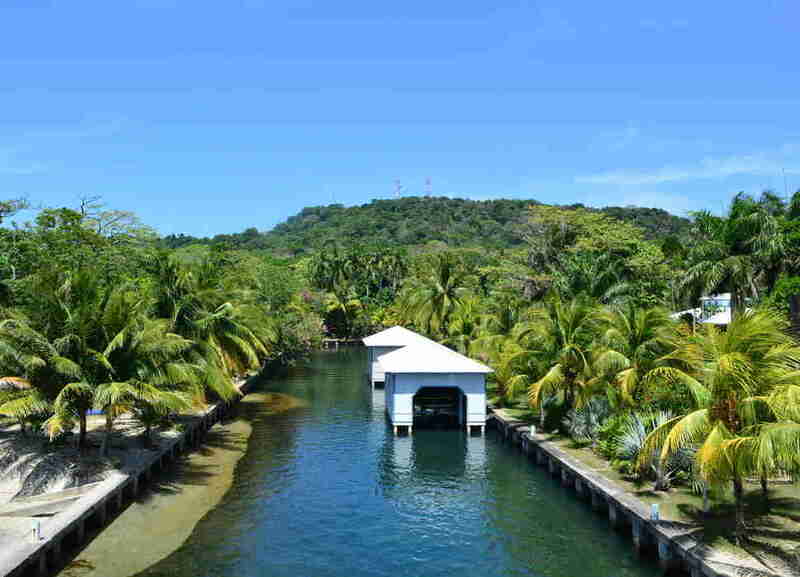 Flights to Belize City are about $350 from US hubs, though San Pedro is the nearest city. There, nicer hotels set you back about $90 a night, but you can find decent ones for $50. Your daily cost aside from diving is under $30. Matt Meltzer is a contributing writer to Thrillist who enjoys posting pictures from the beach on Tuesdays in February. Follow him on Instagram @meltrez1.